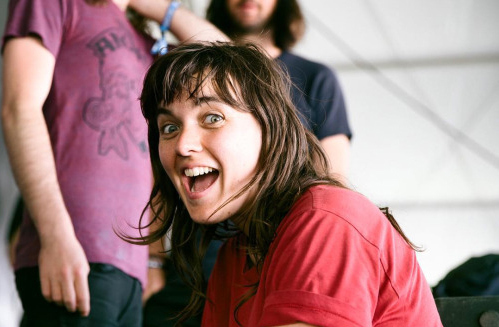 Good old Courtney Barnett, the world's most unassuming rock star, has hired Aussie actress Magda Szubanski to star in her new video, Elevator Operator. If you don't recognise the name, you'll recognise her face: She played Esme Hoggett in the film Babe. Without giving too much away, Szubanski plays a tower block tenant who causes all sorts of havoc for Barnett - the building's bellhop. Along the way, there are cameos for Sleater-Kinney, Jeff Tweedy and some other indie musicians you'll barely recognise. Among them is a band called Batpiss, who I will be checking out on the basis of their name alone. As usual for Barnett, the lyrics have an interesting backstory - as she explained to Nothing But Hope And Passion. "Elevator Operator is a story I wrote about a friend that likes to go to the top of this building to enjoy the view. One day he got into the elevator with this lady, and she freaked out because she thought he was going up to the roof to kill himself. He told me the story, and it seemed to be such a crazy kind of story to me, just a crazy situation. She must have assumed that something was wrong with him, because he was young and had scruffy hair or something – I don’t know." You don't get that with "Fergie" now, do you?